St. Louis, as the chess capital of America, is duty-bound to host the most important national event of the year: the U.S. Championship and the U.S. Women's Championship. The already-impressive tournament has gained more and more prestige year after year, attracting an increasingly stronger field. The Chess Club and Scholastic Center of Saint Louis, the host of the tournament for its past fabulous editions, is ready to send out the invites for the event, to be held from April 13 to 30, and it is a star-studded field. Last year was the debut appearance for Grandmaster Wesley So, one of the top-10 players in the world. After a controversial tournament, So did not finish highly, and he surely wants to prove that he can win the event this year. However, he will have several tough opponents. Reigning champion GM Hikaru Nakamura will be one of the more formidable. After a year full of strong highlights, including his U.S. Championship victory, Nakamura will be one of the front-runners of the event. However, a new challenger is quickly approaching behind Nakamura. Fabiano Caruana, who finalized his transfer to the U.S. Federation last year, will be invited to play in his first U.S. Championship. If all accept, this year's edition of the tournament could feature three world top-10 players! 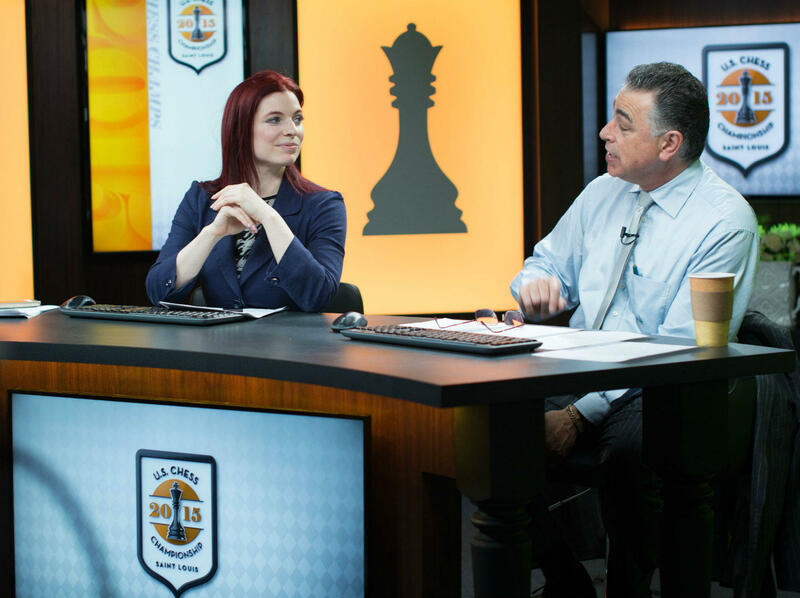 Commentators Jennifer Shahade and Yasser Seirawan host the 2015 U.S. Chess Championships and will return to the Chess Club and Scholastic Center of Saint Louis this year. The tournament will be in an all-play-all format (round robin) and it is rounded off by the U.S. Open winner from last year (Alexander Shabalov, five-time U.S. Champion himself! ), the winner of the U.S. Junior Championship (Akshat Chandra), one wildcard of the organizers’ discretion, and the rest of the 12-player field, which will be invited based on the January rating. The U.S. Women's Championship has seen many new faces in the past few years. Despite the dominance of Irina Krush and Anna Zatonskih in the many past editions of the tournament (every edition since the tournament moved to St, Louis has been won by one of the two players), competition is rapidly becoming stronger. Strong transfers include Katerina Nemcova, Anna Sharevich and Nazi Paikidze. Nemcova specially had a strong performance last year finishing in second place. Besides those listed, Tatev Abrahamyan will also be returning, a player who has been one game away from winning the whole tournament in more than one instance. As is usual now, the tournament will be full of festivities. People can come and enjoy live commentary by grandmasters explaining every game move by move both at Kingside Diner next to the club or at the World Chess Hall of Fame across the street. Moreover, if you want to follow the action but don't want to leave your home, Internet commentary will be provided by the usual grandmaster team of Maurice Ashley, Jennifer Shahade and Yasser Seirawan. There is a twist to this year's championship, though: the top three finishers will be invited to an important side event! Following the tournament, the top three players will play a double round robin (all play all twice) between themselves and a special guest... former World Champion Garry Kasparov! Watching Kasparov play chess against the final three will definitely be a pleasure, so make sure not to miss it! On Dec. 12, 1941, less than a week after the attack at Pearl Harbor, the Japanese attempted to take Wake Island, strategically located in the Pacific, but were thwarted by U.S. forces. Twelve days later, they returned with force and Wake Island was surrendered to the Japanese on Dec. 24, 1941. The soldiers and civilians alike became prisoners of war (POW) and were shipped to Woo Sung, China. Once again, the Chess Club and Scholastic Center of St. Louis held the strongest tournament of the year, but this time there was a little extra! The Sinquefield Cup, which began at the end of August and ended a few days into September, was not only a great tournament but one of the events in the newly created Grand Chess Tour. He arrives in the U.S. as a promising recruit from the Philippines, and in two years makes the jump from the top 100 to No. 10 in the world. He becomes an instant collegiate star, a freshman phenom who leads St. Louis’ powerhouse Webster University program to back-to-back national titles — and then plays the nation’s heartstrings by announcing that his promising future will be played under the red, white and blue for the burgeoning U.S. Chess Federation. 2015 has been a very busy year for chess worldwide and especially in St. Louis. To wrap-up a very successful year for American chess, an exhibition match will be held from Nov. 12-15 at the Chess Club and Scholastic Center of Saint Louis. Top-10 ranked Grandmasters Hikaru Nakamura and Fabiano Caruana will duel in a variety of chess formats at the Showdown in St. Louis. This All-American match is accompanied by a lofty $100,000 prize fund.